A Team of Microsoft Outlook has a new email app, which makes it easier and you have no need to check your inbox. This email app (Send) is released on Wednesday, this app is having an instant messaging approach to your mailbox by stripping out almost every aspect. Send is not a fully featured app, one cannot check the emails which are already received and you can not use it to search your inbox. This app is simply showing threads which have been started from within the app. According to Microsoft this app is to strip out the unwanted and annoying parts of the email: Signatures and Subject Lines, e.g, to create quick messages which you exchange on daily basis with your employees and coworkers in a faster way. While using Send, you don’t need a signature, line for subject or greetings, all this is explained by the Microsoft Outlook team. The basic design principle for the app was to make communication, fast and smooth so that it becomes easy to connect the people who are important to you. If that sound familiar, it’s almost similar to a description of a new chat-style email app from the outlook team, also named as “Flow” that was leaked Online in May. This app is much more look like a chat app that is like an email customer for business persons, this app supports office 365 business and education accounts, messages sent in this app are coinciding to outlook and according to Microsoft this app will work with companies existing IT policies. 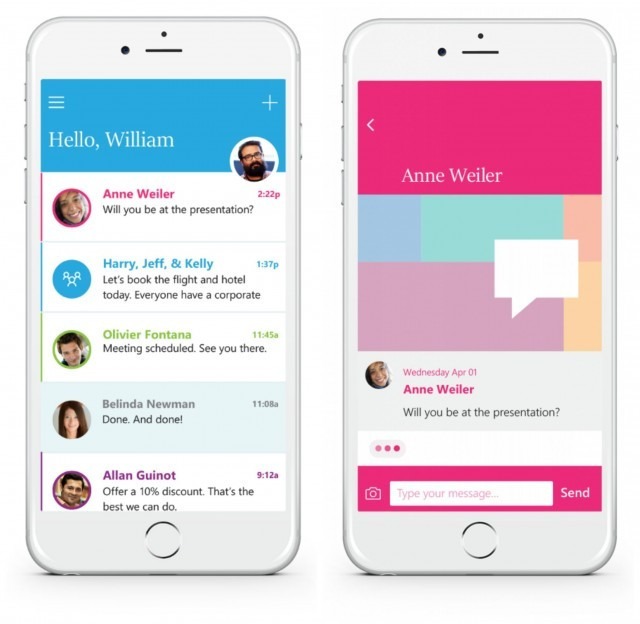 Send is coming out on iOS first, though According to Microsoft, Android and window phones are in the work.